(Be Careful) - Compares Satan's tactics with a lion going about "seeking to devour." First, we need to come to Jesus for salvation in order to have His protection. Explains Christ's atonement and victory over Satan. Satan's tactics: frightening us to make us go to the wrong place for help; pretending to be harmless (angel of light); hiding--pretending there is no evil, no hell or judgment. Conclusion: necessity of faith and obedience. (Walking Together) - How can two walk together unless they are agreed? Refers to when the listener believed and asks, "Having left the path of Satan, have you stayed on the path of Jesus?" -- that is, agreeing with Christian attitudes and behaviour. 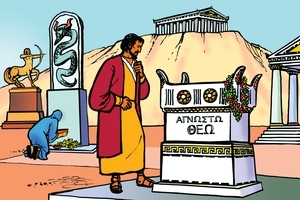 Mentions forgiving others; anger; returning good for evil; greed, etc. If we do not agree with Jesus our path becomes dark. Agreeing results in the fruit of the Spirit. 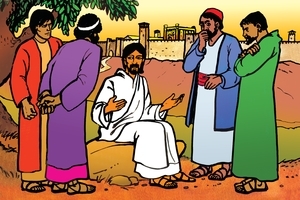 (The Claims of Christ) - Inquiring person asks about Jesus Christ. 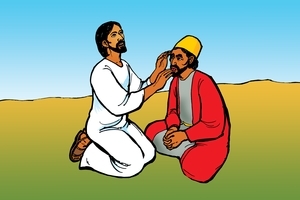 Answer is He lived on earth 2000 years ago, healed all types of sickness etc. His teachings have never been improved on. Quotes from scripture: Hisclaims; basic truths of sin, salvation, hell, eternal life. Invitation given. Conclusion: if you believe He is true, you are faced with a decision. Mostly scripture. 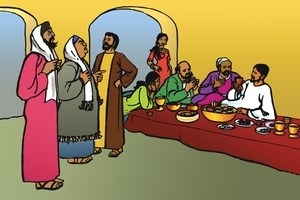 (The Wedding Feast) - Parable of the wedding feast in Matthew 22. Clear application. Several versions. 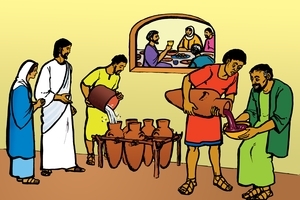 (Wedding at Cana) - For Catholic Areas. 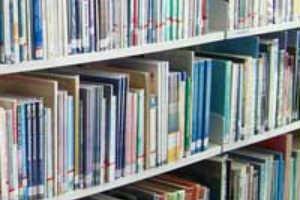 Pre-supposes Catholic background and knowledge. Emphasizes Mary's instructions to the servants at the wedding, relating it to our attitude toward Christ--doing His commands, praying, believing, obeying. Truth of "one mediator," faith in Christ alone, worshipping God only. 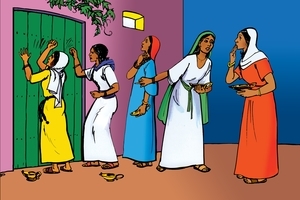 (The Ten Virgins) - Story of the Ten Virgins dramatized Application brings out what false things people trust in -- good deeds, church, Christian parents, etc. A dramatic effect is had by using a different voice for each excuse. 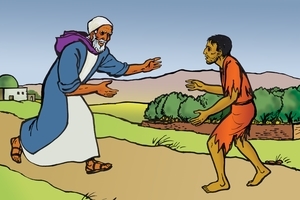 (The Two Roads) - Shows the contrast of the two roads; Jesus' companionship on the narrow road. Joy of heaven. 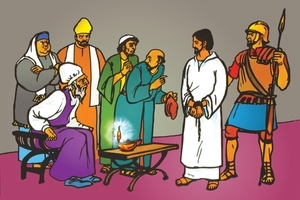 (Barabbas) - Story of Barabbas dramatized. Compares him to the listener-- Jesus came and died to set us free, took our place just as He took Barabbas' place. Ends with sinner's prayer. (How to Find Peace) - Brief description of creation, Adam and Eve and the fall; God's punishment and promise of a Saviour to come. In the meantime blood sacrifice of lamb as a symbol of the future sacrifice of Christ is to be made in order to have peace with God. Fulfillment came later: Christ came, died, rose, returned to heaven--- the perfect sacrifice-- the only one God will accept now. Believe and you will have peace. 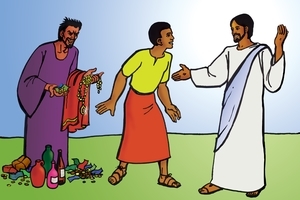 (How to Walk Jesus' Way (modified)) - On Christian attitudes and behavior. Refuse evil; love Jesus supremely; love others and be kind. Allow God's Spirit to control and keep from anger, jealousy, etc. Don't fear evil spirits, but trust God; pray daily; live honestly, etc. Jesus helps us. (Confusion of This World) - Questioner asks how to reconcile the claim of God's love with the facts of constant trouble, confusion, death, and destruction. Answer tells of man's rebellion from God's plan; God's rejection of man's efforts, works, and merit to attain salvation. Summarizes prophecies and fulfillment re Christ's birth, life, death, resurrection, atonement. Emphasizes faith in Christ alone, not good works for salvation. (Do You Know God?) - Compares local beliefs and sacrifices with the truth. 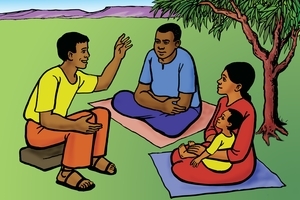 Simple question and answer discussion of worshipping local gods or spirits; Christ's coming to save us; sinful things that God hates; punishment for sin; joy of believing; freedom from other gods through the power of Christ. 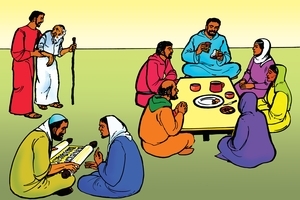 Adapts easily to local customs and beliefs. For those with no background of the Gospel. 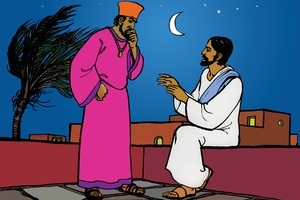 (Tell Me about Jesus) - Dialogue between father and son. Covers creation, fall, redemption, future abode. Can be used as a children's record, or a dialogue between adults. Scripture can be easily paraphrased. 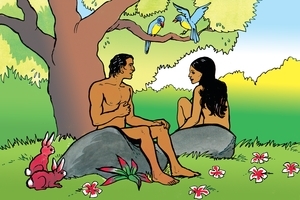 (Creation and Redemption (dialogue)) - Introduces local belief of origin of man by a question. Biblical account of creation, fall and redemption follows. S.E. introduced as creation is mentioned. Simple invitation concludes. Adaptable to local beliefs. Easily made into monolog by deleting second person's comments. Virtually the same content as the monologue # 19 "Creation and Redemption of Man." 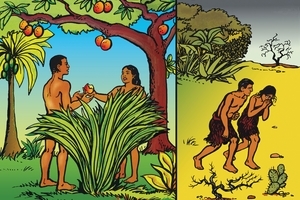 (Creation and Redemption of Man) - Introduces local belief of origin of man by a question. Biblical account of creation, fall and redemption follows. S.E. introduced as creation is mentioned. Simple invitation concludes. (The Creation and Fall) - Story of Creation and Fall, in simple language. (Christ in You) - Conversation between two Christians reading Scripture and discussing the high standards set by God. 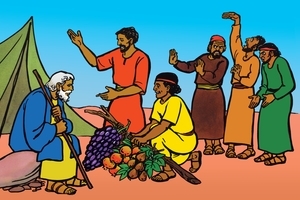 Discovering the solution of "abiding in the Vine." 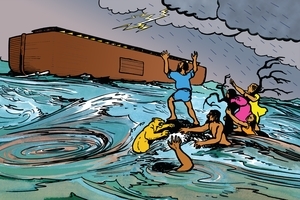 Adaptable to local needs by changing the Scripture quotes to apply to problems among them. (Christ Our Victory) - First paragraph gives clearly and concisely the important beliefs applied personally which are necessary to be a real Christian. Rest of script explains why some Christians are not victorious and have no assurance. Sin reigns instead of Christ. Letting Christ reign results in victory, love, peace etc. Christ living in us is the answer. 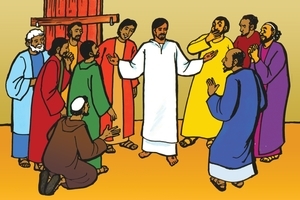 (Christ Our Mediator) - Emphasizes that Christ has taken the place of the O.T. priests. Christ was God's provision for bridging the gap between sinful men and a holy God. Jesus' sacrifice was once for all. Death, resurrection, ascension. 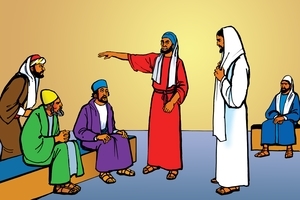 He became our mediator--our High Priest. Necessary to trust Him only. Two versions of this -- for Catholics; for tribal beliefs. 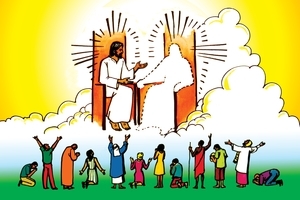 (From Creation to Christ) - Explanation of creation; wickedness of man; Abraham, the family who obeyed God; God's laws given; God's laws broken by all; Christ's death and resurrection; His preparing a place for His followers. (The Incomparable Christ) - An eloquent description of Christ -- where He came from; His remarkable birth and life and power. Uses contrasts to emphasize the uniqueness of Christ. (God Our Creator) - Straight forward summary of : man's impotence and transience compared to God's power. Story of creation; fall; doom; coming ofChrist; His miracles; crucifixion; resurrection; ascension. Believe ---receive, and God will give eternal life. Very concentrated. Too much for some groups. 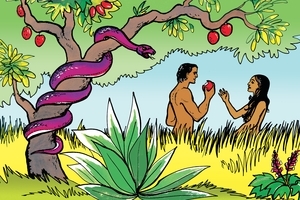 (God's Hatred of Sin) - Refers to traditional tribal religious customs. "We did not know" the truth: peace from God; His words; His hatred of sin; Jesus' death in our place. Punishment great for those who refuse Jesus. Warning to Christians about going back to old ways. God does not let sin go unpunished. Good for areas where there are nominal Christians. Is both evangelistic and teaching. (God Can Change Our Nature) - Points out that the sinful nature of man is obvious. We cannot change ourselves because it is our nature to sin. Illustration of the pig and cat natures. God can change our nature when we are willing to turn to Jesus. Jesus came and took our punishment for the purpose of helping us and giving us a new nature. (The Sickness of Man) - Compares physical sickness with "sickness of the soul" -- sin. Christ's power to heal both. Changed lives of those whom Christ heals. 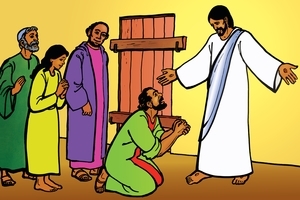 Ask forgiveness of Jesus. (The Two Masters) - Contrasts Satan and God - their attitude toward man and their purposes. Results of following each. Description of heaven and hell. Sinner's prayer. (Teach All Nations) - Begins with great commission then obedience to the commission. 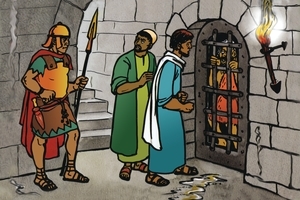 Paul and Silas in Philippi and the subsequent imprisonment, singing, earthquake and conversion of jailor. 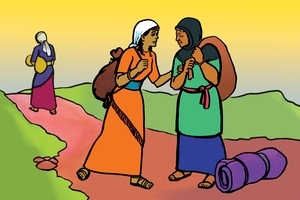 Acts 16:16-34. Challenge to witness and not be ashamed of the Gospel. 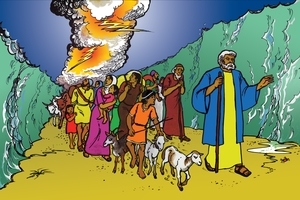 (Choosing the Right Road) - Illustration of man and oxcart going in the dark, coming to crossroads and not knowing which way. Compares with journey of life. Only one road leads to God. Refutes idea of all roads leading to God. 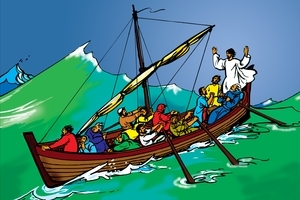 Jesus the only one who can lead us. All others lead to hell. (Slaves) - We are all slaves of Satan until Christ frees us. How Satan holds us: by the power of a great hunger---lust, greed, pride, etc. Freedom only through Christ. His atonement. Satan's power broken. Man can choose. Sinner's prayer. Worship Jesus only. All will have to bow to Him some day---even those who refuse now will then have to acknowledge Him. (The Holy Spirit Brings Liberty) - Story of an eagle who didn't fly after it was free, because it didn't know it was free. How to be filled with the Holy Spirit. Proof that someone is filled with the Spirit. Don't grieve the Holy Spirit. (Are You Afraid?) - Introduction is on local fears. Questions directed to listener. Explains freedom from fear through Jesus. Mentions His miracles, power, willingness to help and save, deliver and protect. His power is greater than demons, witchdoctors, curses. Jesus overcame Satan and death. 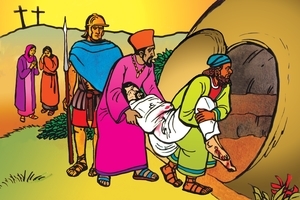 When He arose from the dead He received from God all power. Therefore He will give eternal life to all who believe in Him and they will be free. 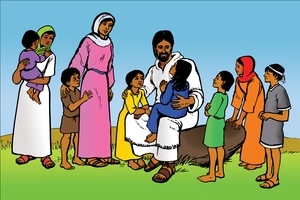 (The Christian Family) - Practical advice from Bible. Men, seek Christian wives to love and help and talk and pray with. Wife challenged to diligence, teaching children, obedience, faithfulness, not gossiping, and helping the helpless. Parents to dedicate children to God, teach them to follow God, discipline them and teach them obedience. 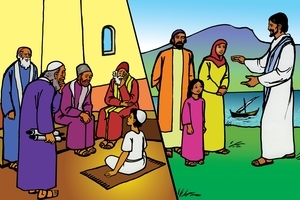 (Gehazi) - Story of Gehazi. "Be sure your sins will be revealed" is the emphasis. Speaker is supposed to repeat this with dramatic emphasis whenever it comes in the story. Application underlines the fact that punishment for sin always comes, whether in this life of afterwards. 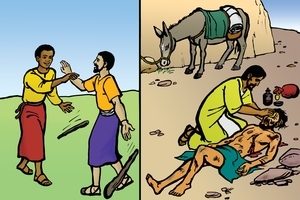 God will heal the leprosy of sin for those who repent. 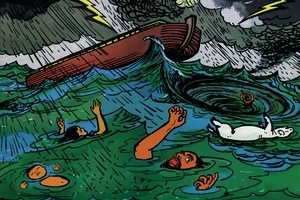 (Jesus Calms the Storm) - Story of Christ asleep in the boat, etc. from Matt.8. Application for the unsaved. Prayer of repentance. 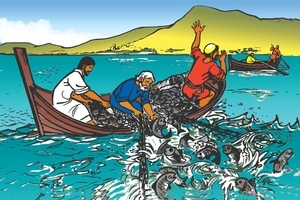 (Jesus and the Fishermen) - Jesus came from God to tell people about God. He lived on earth as a man. Incident of the big catch of fish. 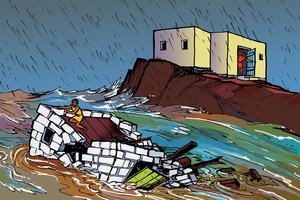 Incident of calmingthe storm. 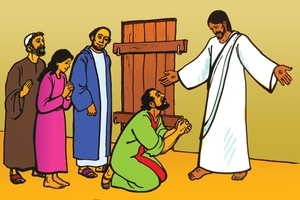 Mention of other miracles.Explanation of His power, atonement. Happiness and heaven is for the believer. (Jesus, the Mighty One) - Sinful people bound by Satan; God's concern. Jesus' life on earth, His death and resurrection; victory over Satan and evil spirits. 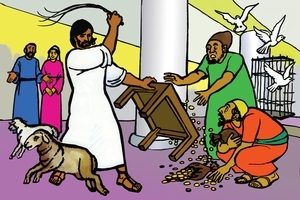 Illustration of Jesus' power. Invitation. 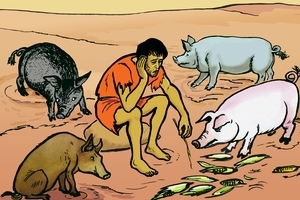 (Jonah) - The story of Jonah, for adults. Mark 16:16. John 3:16. 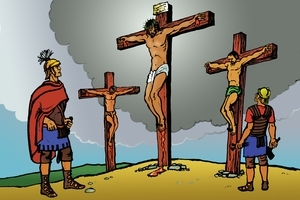 (Trial and Crucifixion of Christ) - The main body of the script gives the story of the crucifixion in detail, and of the time following His resurrection and the great commission. Invitation. (Deliverance from Demons) - Very simple discussion showing that Jesus is more powerful than demons, and will protect those who trust Him. He can free them from demon power. Prayer of repentance given. 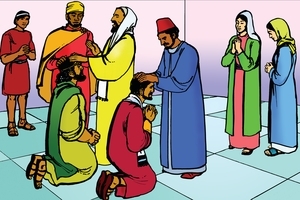 (The True Light) - Refers to tribal laws, fears, customs briefly, and that they did not know God. Now the message has come. God is the creator of all. Explains about Satan and evil spirits. God's power and the ultimate end of Satan. Satan's deceptions. God's provision for man's redemption. Application and invitation. 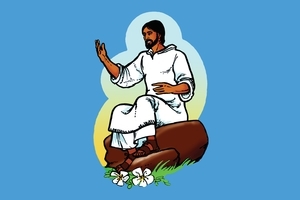 (More about God) - Explains in very simple sentences about the incarnation, atonement, the fact of the Trinity, God's greatness, omnipresence,love. God's desire to dwell in us; our need of cleansing; God's power in our lives. Satan's deception, hatred, power. God's deliverance; our obedience. Invitation. Very short sentences. 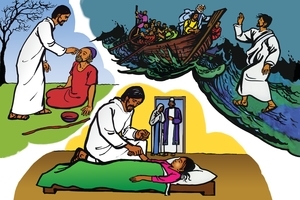 (Miracles of Jesus) - Account of the healing of the paralytic (Mk.2:1-12) and the boy with the demon (Mk. 9:14-27). Emphasis on Christ's power over sickness and sin. Abrupt application. (I Have Decided) - Compares life to a journey. Explains the two roads people take. Not a dialogue but spoken by two narrators. Is similar to The Good Road, The Two Ways, etc, but different form. Sin is a heavy burden to carry on the journey. Second part is a testimony. (The Death of Christ) - Because different Muslim sects have different views about the death of Christ, this script uses a question about it as an opener. Quotes Isaiah in answer and then tells why He died--- as atonement, and the facts of His death. 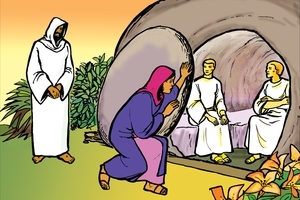 His resurrection and ascension described. Fulfillment of prophecy. Christ's return will be to judge the world. 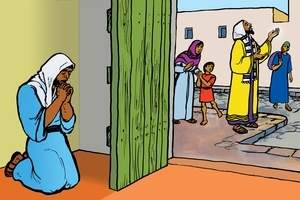 Urges listener to repent while there is opportunity. Although focused for Muslims, this can be used where there is some background knowledge of Christian and Jewish Scripture. 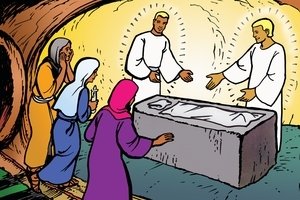 (Death and Resurrection) - The major part of the script deals with the details of the crucifixion, burial, empty tomb and angel's declaration. It includes briefly the appearance of Jesus to His followers; His command to go into all the world; His going back to heaven to prepare a place for believers; unbelievers will go to the place of suffering. 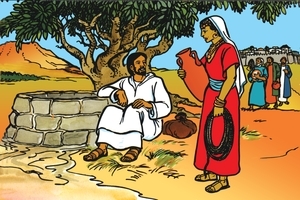 (The Woman at the Well) - The story of the woman at the well, in dramatic narrative form. Simple application and invitation. (Fear Not) - Directs questions to listener about his fears. Fear of death, future, spirits, other. Those trusting Jesus (who has all power) need not fear these things. Invitation. 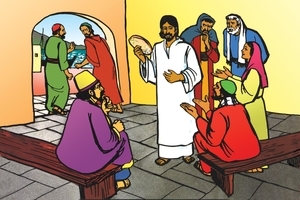 (On the Beach) - Setting of the disciples fishing after the resurrection and the miracle of the large catch of fish. Mostly paraphrased scripture.- John 21:1-14 Emphasizes Christ's power and omniscience. See also "Jesus and the Fishermen." (Our Enemy) - Account of Satan's fall through pride and his exile along with disobedient angels who became demons. Deals with Satan's deception through idolatry and drunkenness, his future in hell with his followers; our helplessness; God's power in our behalf. Appeal to be delivered from his power through new birth, also a prayer for power in temptation. (A New Nature) - About sin and the need of inner cleansing which is beyond our power. Illustration of leopard who cannot remove his spots or change to eating grass. We need Christ to change us and give us new natures. We can ask Him to do it for us and He will. There is an optional paragraph which mentions the millenial reign when even animals' natures will be changed. 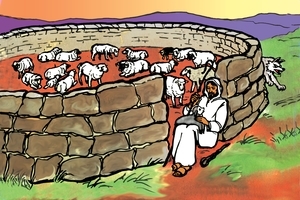 (The Good Shepherd) - Jesus is the Shepherd who gave His life for us, the sheep - all who believe. He cares for us and leads us to heaven. Jesus will come for His followers and reward them but those who do not believe will not go with Him but will be put into the place of fire. Don't wait. Be ready. Turn to Jesus and obey Him. (The Way to Heaven) - Directed to those questioning about what is after death, reincarnation, etc. The Bible tells us that after death, the spirit lives; we go to heaven or hell. Jesus came from heaven and He can take us there. His redemption of man; His death, resurrection, ascension. His power to cleanse and renew. Jesus is the only way to heaven. 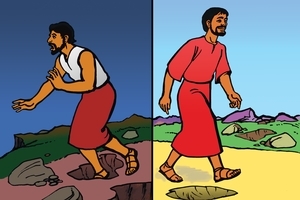 (How to Walk the Jesus Road) - Simpler version of #61 "How to Walk Jesus' Way," but it mentions things that hurt the body such as alcohol; and God's standard about having one wife. (Heaven and Hell (dialogue)) - Intro: a man has died and there is mourning. Discussion about death: once there was no death; man sinned and now all die; two places, heaven and hell. Question about rebirth (reincarnation). Bible says no. Heaven for the righteous-- only Jesus can save us because of His death and resurrection. (The Heart of Man) - Refers to local market scene as introduction. Discussion about people and that no one knows what is in the heart of even one who appears to be good. But God is not deceived; knows all; sees all our sins. Sins listed. God's anger against sin. Punishment results. Only way out is to ask Jesus to save us. 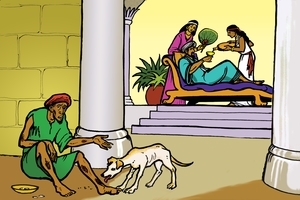 (The Prodigal Son) - Story of the prodigal son dramatized, with application. Invitation and sinner's prayer. There are several versions of this; some have direct Scripture quotes; others paraphrase. 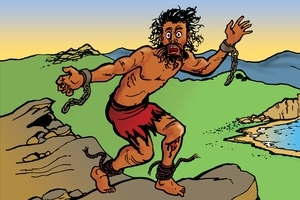 (The Cruel Master) - A special script used where drunkenness is an outstanding problem. Describes liquor as a cruel master who makes people do terrible things, robs them of their possessions, etc. Freedom comes only through Christ. Tells of Christ's atonement and victory over Satan and evil spirits. Invitation. 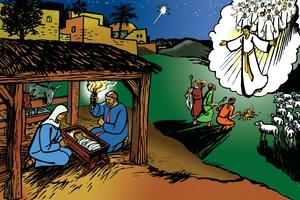 (The Birth of Jesus) - Tells of Mary, the angel coming to her and also to Joseph. They both believed and accepted the message. 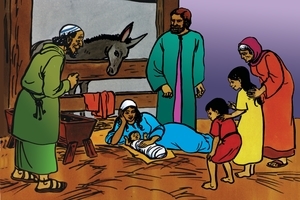 Jesus was born, grew up, went about teaching and healing. His power, love, death and resurrection. Invitation. 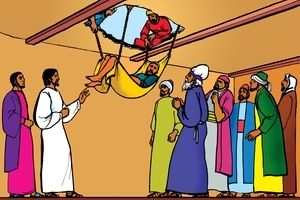 (The New Birth) - The story of Nicodemus. Illustrates the thought that some people follow religious customs but don't recognize the spiritual basis and the necessasry new birth. Being born spiritually makes it possible to escape the consequences of sin. A new nature is needed in order to live a new life, and the ony way to get it is through being born spiritually into God's family. (The Witchdoctor) - True story of a witchdoctor in Brazil. 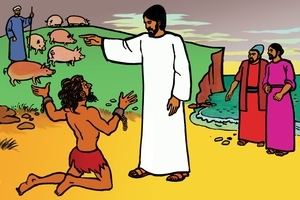 Tells of dream and subsequent demonic experience connected with wild pigs and decision to be a witchdoctor; his power as such; then hearing about Jesus and turning to Him; the fear of the people for him andthemselves--- expectation of reprisal from the spirits. His experience as wild pigs (associated with the spirits) came; his lack of fear. His protection from them as he flouted all supersition, and eventual conversion of most of the village. Short application. (What Is a Friend?) - Contrasts earthly shallow friendships with the Friend who gave His life for His friends to rescue from the deceptive traditions of Satan. 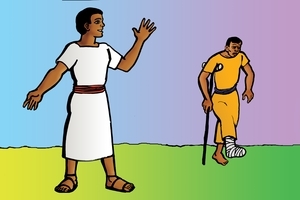 Illustration of a person with snakebite wanting a friend with medicine rather than one with kind words. Be Jesus' friend and go to heaven. (What Is a Christian?) - Dialogue on the meaning of being born again. Invitation. 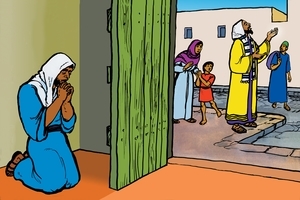 (Prayer Is Talking to God) - (formerly called "Prayer") For untaught Christians about prayer. Thanking God; asking for help; needs; problems; wisdom; forgiveness of sin. (The Rich Man and Lazarus) - Story dramatized. Emphasis is on no chance after death. Hell and heaven are real. Christ died, rose, and ascended that we might be free from judgment. Snare of materialism. Life is short---after death is long. 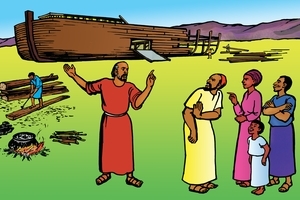 (The House on the Rock) - The story of the foolish man and the wise man (who built a house on sand and rock). Sinful people will be punished. 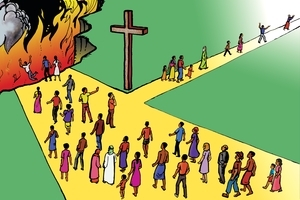 (The Two Ways) - Two places where souls go; two roads--- wide and narrow, leading to heaven. Describes the difference. No other way to get to heaven-- not by burning candles, worshipping Mary, sacrificing to spirits, etc. Only through Christ. Invitation. Presupposes knowledge of Jesus and the Bible. 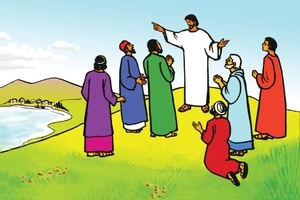 (God's Commands for His Children) - Explains when a person is saved, God's spirit comes to live in him and help him. 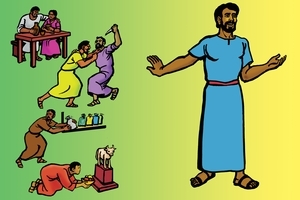 Outlines attitudes and behavior expected of a Christian: trust God; be thankful; love and help others; obey God and learn more about Him; pray often; meet with other believers; confess sin and ask forgiveness if sin overtakes. 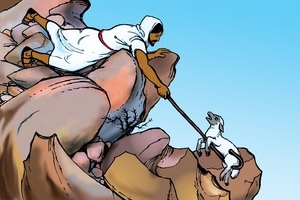 (The Lost Sheep) - Parable of the lost sheep dramatized. Application: all people are lost. Jesus, the Good Shepherd, seeks lost ones. He calls us; answer Him. The Scripture passage can be used with this application, if preferred. 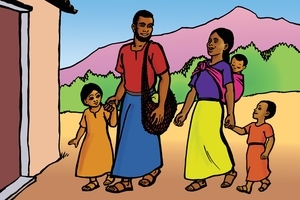 (The Father of Lies) - First person testimony of a converted Central American witchdoctor; some of his customs and power in practice; his dialogue with Satan who tells him lies to keep him from becoming a Christian, Very culture-specific but sample of a powerfully effective testimony. Concludes with Christ's teaching about Satan as deceiver and murderer. Follow Christ, the Way, Truth and Life. 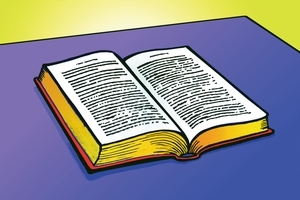 (The Word of God) - Explanation of origin of the Bible. Different quotes on guidance; the Word; keeping God's commands; doers not hearers only; abiding. Presupposes background knowledge. Pecado, O que é isto? (Sin, What is It?) - Discussion of what sin is; why God commands us not to do certain things; list of sins plus emphasis on the "great" sin of worshipping any other beside God. 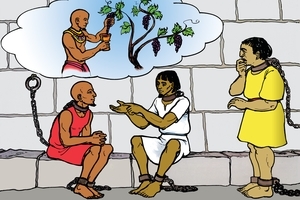 Danger of being captive to evil spirits. Danger of compromise. True belief and trust leads to a clear break with sinful activities. Ultimate results---every knee shall bow either in worship or in shame. (Power over Evil Spirits) - Refers to local practices to appease evil spirits and the failure to get relief. Tells of Christ's power; the need to believe and trust Him. Tells about eternal life; heaven and hell; Christ's atonement. Invitation concludes with sinner's prayer. (Can You Find God?) - It is impossible to find God by own efforts. Comparison with the sun--power, light, blessing. God manifests Himself though we can't seek Him out. Jesus's teachings which are holy bring light, revealing good and bad. Peace comes from Christ-- and eternal life. This avoids most expressions offensive to Muslims. Refers to the prophets they are familiar with. Porque o homem teme a morte? (Why Does Man Fear Death?) - Man's fear of death basically because of the guilt of sin and fearof judgment. Attempts to find a way to escape. True answer is inChrist. Need of personal acceptance. Invitation. Scripture quotes at end. 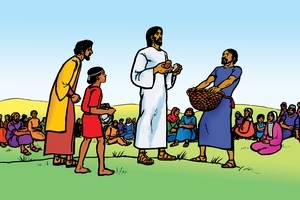 (Basic Principles) - Directed to or about the new Christian. Comparison with human family. Born into God's family - receives parental care: assurance of love, etc. Infant needs to breath: prayer. Needs food: Word of God. Needs exercise: obedience and witnessing. Remedy for failure and sin: cleansing. Confession, forgiveness, restoration. (Who Is He?) - About Christ; His life, miracles,death,resurrection,ascension--- all without mentioning His name till the last paragraph. For fanatic Muslims who spurn the name of Jesus. Name can be introduced at beginning if desired when using for other groups. 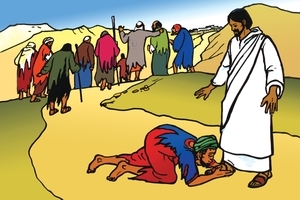 (Who Has Power to Forgive Sins?) - Christ's claim to be Saviour; His death as a sacrifice for sin. Those who trust Him receive forgiveness and reconciliation with God. Written for Muslims, but useable elsewhere for those with some knowledge of Christian concepts. (The Second Coming) - Questions answered about Christ's return, mostly by direct Scripture quotes. When will the world end? Why will Christ come? How will Christ reward His followers? How to be ready for His coming. 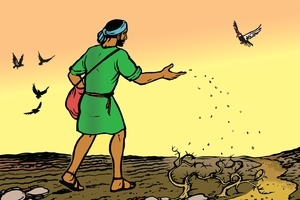 (The Parable of the Sower) - Tells the parable in simple language; then gives the explanation of the meaning. Simple and straightforward. (Freedom from Fear) - Questions directed to listeners re their fears. 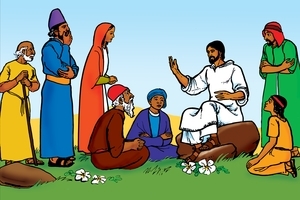 Tells of Jesus' power, His miracles, and who He is. His desire to free us from the power of Satan, witchcraft, etc. We must turn to Him, away from evil. With Jesus we are free from fears. Jesus is all powerful --- greater than Satan--- overcame death so we can have eternal life and happy future. Invitation. One of several of the same theme, but on different levels. (Fear God) - Begins with reference to local custom of sacrifice. Appeasing spirits because child is ill. Explains there is one "Good Spirit" who has all power, made everything, etc. Others are evil spirits.Those who trust God need not fear them. God is not far away as believed. Christ's atonement explained. God's anger against sin; judgment. Sins listed. Invitation. 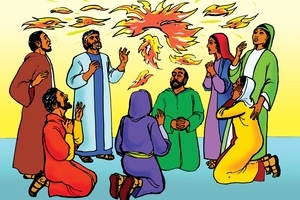 (Witnessing) - Almost the same as "Spread the Good News," Contains a little more explanation of what the message is that they are giving. (Everyone Must Stand before God) - Focuses on the sinfulness of man and the holiness of God; His perfect holiness, mercy, justice. 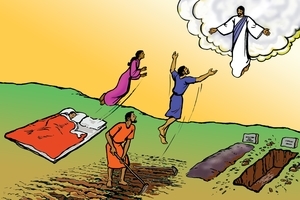 The day of judgment; escape from eternal death through Christ. (A Clean Heart) - Refers to man's fear of death because of the fear of judgment. Man followed Satan and now it is his nature to sin. Refers to Muslims' concept of "good deeds", but points out that even a trip to Mecca does not change the person. Remedy: Christ, who is God, became man and became the sacrifice for sin. Believing and receiving forgiveness results in "good works". Fear of death leaves because sins are forgiven and heaven is certain. Vais tu para o céu? (Are You Going to Heaven?) 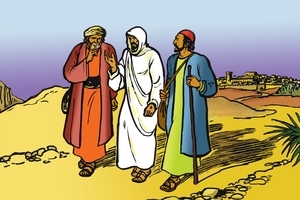 - Three ways to be sure: Be on the right road--Jesus, the only way; no saint or priest needed. Evidence of a changed life because Christ makes one new. Inner knowledge -- witness of the Spirit which gives a sense of belonging and peace. Sums up the message by direct questions to listener. 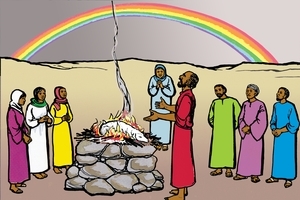 (How God's Children Should Live) - Simple explanation of Christian attitudes and behaviour standards. God's power to keep us from sin when we yield to Him. Christians should: listen to God's word; reject old life of sin; keep their bodies holy; flee from idolatry, immorality, lying; care for their families; show love to all, including enemies; fear not; pray often; give materially; be thankful; tell others the Good News. (After Believing) - On recognising the enemy and resisting him. Need of living by God's Word, avoiding evil, confessing sin and walking in obedience. Materialism a danger. Trials and suffering allowed to strengthen us. 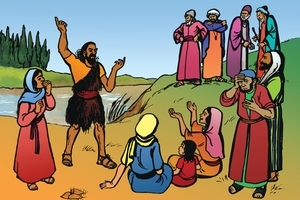 (The Return of Christ) - Tells of Christ's promise to return. How, why, and when. What will happen to the unsaved. Must be ready. Invitation.